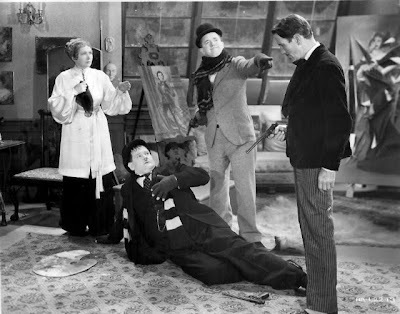 The Fixer Uppers is an average Laurel and Hardy short greatly enlivened by the inebriated antics of Hollywood’s greatest character drunk, Arthur Housman. While Housman is not as central to this short as he was in his previous pairings with the boys, Scram! (1932) and The Live Ghost (1935), he steals every second of screen time he’s given from his co-stars. It is a credit to the temperaments of Stan and Ollie that they continued to work with a comic who consistently upstaged them. As the film opens (in Paris of all places), Stan and Ollie are impoverished door-to-door salesmen hawking Christmas cards of their own creation. They first come to the apartment of a drunk (Arthur Housman) who is nursing a killer hangover with a tall glass of whiskey. Rather than turn the peddlers away, the genial juicer encourages them to read the sentiments from a few of their wares and eventually provides their first sale. When Stan and Ollie try their luck at the apartment next door, they find a woman (Mae Busch) weeping due to the neglect of her artist husband (Charles “Ming the Merciless” Middleton). Stan comes up with a plan (never a good idea) to help the woman win back her husband’s affections by making him jealous. Unfortunately, when the artist finds his wife in Ollie’s arms, he challenges the rotund salesman to a duel. While Ollie reluctantly agrees to return at midnight to exchange pistol shots, he realizes over a beer with Stan that there is no reason to risk his life, because the artist has no way to find him. Unfortunately, fate in the form of Housman’s drunk eventually reunites Stan and Ollie with the jealous husband. This was Laurel and Hardy’s penultimate short subject before they would devote their time entirely to feature-length comedies. While The Fixer Uppers is nowhere near their best work, it is brisk and amusing throughout, unlike many of their slow and padded features. The short features a few clever comic plot twists (especially the manner in which the boys end up reunited with Middleton); but the main reason to watch the movie is to see the comedy duo work with Housman. Housman’s comic reactions to the boy’s Christmas cards at the beginning of the film and his later scenes in a café attempting to get a bartender to serve him a “small big one” are the film’s comic highlights. Potent Quotables--OLLIE (to waiter): Two beers. What'll ya have? STAN: I’ll have two beers too. Video Availability--You can find the short on DVD in the United Kingdom, Germany, and Holland, but it has not been officially released in the U.S. However, Hollywood's Attic provides a collector's copy in Laurel and Hardy Classic Shorts (Volume 6). 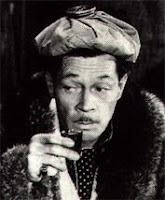 Similarly Sauced Cinema--Arthur Housman also provided comic support to Laurel and Hardy in Scram! (1932), The Live Ghost (1934), Our Relations (1936), and briefly in The Flying Deuces (1939).